A fierce torrential downpour can transform even the prettiest lawn into an ugly expanse of swamp land. Without a proper drainage system, standing water woes can range from the spawning of mosquitoes and other unwanted pests to encroaching fungus and disease. Most trees, shrubs, and other forms of plant life are unaccustomed to overly-saturated soil, which can cut off oxygen and lead to root rot, killing your greenery and flowers. What’s more, unchecked erosion can yield tremendous and costly problems, from water seepage into a home’s basement to significant foundation damage. 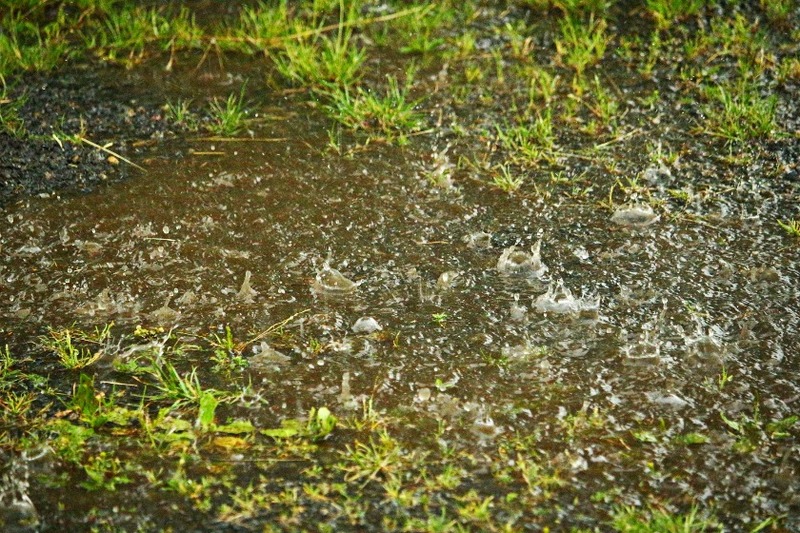 Common reasons for drainage issues include lawns with a high water table, or homes built atop dense, clay soil that prohibits the permeation of water. When water cannot penetrate a lawn’s soil, it will naturally follow the force of gravity to the lowest point of the yard, where it can become trapped and pool. Additional causes include poorly graded lawns that send water toward a home, instead of away from it, and improperly installed downspouts and gutters. Professionally-installed drainage systems can help you keep your head – and landscape – above water. Catch basins collect excess rainwater from hardscaped areas, flower beds, and other landscaping features. A collection box with a slotted top and a drainage outlet is installed in-ground, where it empties into a buried drainpipe. The water is then diverted to a surface drainage system. This particular setup requires some moderate, routine maintenance, as the basin must be cleared regularly of leaves and sediment. Gravel-filled trenches, often called French drains, involve a perforated pipe surrounded by gravel and lined with sturdy fabric or sand. French drains direct water to an appropriate outlet, such as a rain garden or sloped land, where, ideally, it can soak into soil. Additionally, this setup can be connected to a downspout or used in conjunction with a catch basin. Rain barrels can collect water from downspouts that would otherwise run into your yard, which can then be saved and used for irrigation purposes at a later date. Gutter repair or replacement may be all that is needed to cut down on water runoff at your home. Homeowners are encouraged to inspect and clean their gutters regularly, checking connections and sealing any loose joints. Unwanted and unexpected water can wreak havoc on your lawn, landscape design, and home, racking up costly repairs in the process. Chesapeake Irrigation & Lighting’s team of specialists can help you ward off water dangers with professionally-installed yard drainage systems. Call us at 410-987-2969 or request a quote today.